The Evolution of Marvel's Ultimate Super-Hero! According to Nova's creator, Marv Wolfman, the story of Nova begins around 1966. As the publisher of a superhero fanzine called SUPER ADVENTURES, Wolfman created a character known as "The Star" in issue #3. The Star was a doctor named Denteen who found a spaceship containing alien pills which gave him a different super-power every five minutes. Among his powers were flight, laser vision, energy absorption, teleportation and the ability to create illusions. He could also project energy blasts, radioactive gas and freeze beams from his hands. Along with the pills, he found a small device which created new pills when needed. The pills and the device had been created by Kraken Roo, an evil alien from the planet Orion 2. 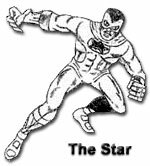 The Star became a founding member of a super-hero team called the Law Legion. In an offset supplement to Super Adventures #6 (mistakenly labeled Super Adventures #7 offset supplement) entitled 'Who Can Defeat A God? ', Wolfman and Len Wein changed the Star into a new hero. In the story, Kraken Roo has been sentenced to life in Orbitron, Orion 2's orbiting prison. As the force beam transports him towards the prison, Orbitron is hit by a stray meteor and knocked out of position causing Roo's beam to continue on into space for months. Finally, the beam intersects with mighty cosmic streams! The merging of the storm's cosmic radiation and the force beam accidentally turns Kraken Roo into an all-powerful being called The Celestial Man. The Celestial Man goes to Earth to find the man who came into possession of his super-power pills. During his battle with the Law Legion, Cosmic Ray and the Celestial Man exchange power bursts. The resulting collision bathes the Star in energy and splits him into two beings! The leader of the Law Legion, the Brain, realizes that the two beings cannot exist at the same time. As a result, the Brain changes one into a new being while Celestial Man absorbs the remaining Star. This new being created by the Brain now has all of the powers of the pills minus the power of flight. To compensate, the Brain gives the altered man a pair of "sky skates" which allow him to fly. With this change came a new name and costume (designed by Len Wein). The character's name became BLACK NOVA. Black Nova defeats Celestial Man by using his new energy absorption power to dissipate the cosmic criminal. In Super Adventures #9 (1969), Black Nova and the Law Legion battled the Brain (who was now evil) in his floating island/airship. After the Brain and his henchmen (the Bombadier and the Slicer) were defeated, the Law Legion were facing certain death as the airship was falling to Earth. Black Nova told his teammates that he would control the ship until they could get to safety and would escape via his sky skates. What he didn't tell them was that his sky skates were damaged in the battle and that he was sacrificing himself to save the Law Legion. Black Nova met his noble death when the airship crashed but only after having saved the entire Law Legion. *Nova is a teenager. Black Nova was an adult. *Black Nova had 5 chest stars vs. Nova's 3. *Black Nova had no starburst on his back while the starburst on Nova's back is on Black Nova's belt. *Black Nova had a helmet antennae. Nova has a stylized star on his helmet. *They had different powers and origins. In the original Star story, Denteen didn't adopt a costume immediately after finding the super-power pills. The Star costume debuted in Super Adventures #4. 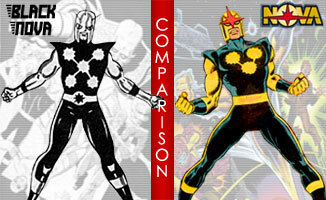 The Black Nova costume was created by Len Wein and was designed to be black and yellow. However, due to the fanzine's format, it appears black and white in print. The hero's helmet was inspired by a 1965 one-shot Doctor Strange villain named Tiboro. Years later, John Romita Sr. and Marv Wolfman made the changes to the Black Nova costume, added a comet streak to his flight visuals (inspired by the cartoon character, Mighty Mouse) and created a new origin. The revamped character saw publication in Nova #1 (1976). The Star, Black Nova and Super Adventures images and other characters mentioned (with the exception of Nova) in the Star/Black Nova section are Trademarks of Marv Wolfman and are used with permission. Copyright 2002 Marv Wolfman. All Rights Reserved.